2.3.1 "The 'Iron Lady' Sounds the Alarm"
Margaret and her elder sister were raised in the bottom of two flats on North Parade. "The 'Iron Lady' Sounds the Alarm"
"Being Prime Minister is a lonely job. In a sense, it ought to be: you cannot lead from the crowd. But with Denis there I was never alone. What a man. What a husband. What a friend." 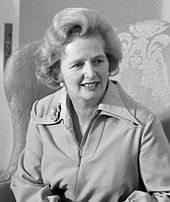 "Margaret Thatcher was not merely the first woman and the longest-serving Prime Minister of modern times, but the most admired, most hated, most idolised and most vilified public figure of the second half of the twentieth century. To some she was the saviour of her country who ... created a vigorous enterprise economy which twenty years later was still outperforming the more regulated economies of the Continent. 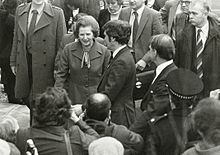 To others, she was a narrow ideologue whose hard-faced policies legitimised greed, deliberately increased inequality ... and destroyed the nation's sense of solidarity and civic pride. There is no reconciling these views: yet both are true." Adeney, Martin; Lloyd, John (1988). The Miners' Strike 1984–85: Loss Without Limit. Routledge. ISBN 978-0-7102-1371-6. Agar, Jon (2011). "Thatcher, scientist". Notes and Records. 65 (3): 215–232. doi:10.1098/2010.0096 (inactive 15 March 2019). Aitken, Jonathan (2013). Margaret Thatcher: Power and Personality. A & C Black. ISBN 978-1-4088-3186-1. Anwar, Muhammad (2001). "The participation of ethnic minorities in British politics". Journal of Ethnic and Migration Studies. 27 (3): 533–549. doi:10.1080/136918301200266220. Atkinson, Max (1984). Our Masters' Voices: The Language and Body Language of Politics. Psychology Press. ISBN 978-0-415-01875-3. Barker, Martin (1981). The New Racism: Conservatives and the Ideology of the Tribe. London, UK: Junction Books. ISBN 978-0-86245-031-1. Barr, Damian (2013). Maggie and Me. A & C Black. ISBN 978-1-4088-3806-8. Barrell, Ray, ed. (1994). The UK Labour Market: Comparative Aspects and Institutional Developments. Cambridge University Press. ISBN 978-0-521-46825-1. Beckett, Andy (2010). When the Lights Went Out: Britain in the Seventies. Faber and Faber. ISBN 978-0-571-25226-8. Beckett, Clare (2006). The 20 British Prime Ministers of the 20th Century: Thatcher. Haus. ISBN 978-1-904950-71-4. Bern, Paula (1987). How to Work for a Woman Boss, Even If You'd Rather Not. New York, US: Dodd Mead. ISBN 978-0-396-08839-4. Blundell, John (2008). Margaret Thatcher: A Portrait of the Iron Lady. Algora. ISBN 978-0-87586-632-1. (2013). 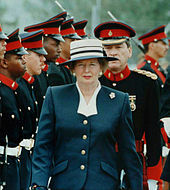 Remembering Margaret Thatcher: Commemorations, Tributes, and Assessments. Algora. ISBN 978-1-62894-017-6. Burns, William E. (2009). A Brief History of Great Britain. Infobase. ISBN 978-1-4381-2737-8. Butler, David; et al. (1980). The British General Election of 1979. Palgrave Macmillan. ISBN 978-1-349-04755-0. (1994). British Political Facts 1900–1994. Macmillan. ISBN 978-0-333-52616-3. Byrd, Peter, ed. (1988). British Foreign Policy under Thatcher. St. Martin's Press. ISBN 978-0-86003-401-8. Campbell, John (2000). Margaret Thatcher: The Grocer's Daughter. 1. Pimlico. ISBN 978-0-7126-7418-8. (2003). Margaret Thatcher: The Iron Lady. 2. Pimlico. ISBN 978-0-7126-6781-4. (2011a). Margaret Thatcher: The Iron Lady. 2. Random House. ISBN 978-1-4464-2008-9. (2011b). Freeman, David (ed.). The Iron Lady: Margaret Thatcher, from Grocer's Daughter to Prime Minister. Penguin Books. ISBN 978-1-101-55866-9. Childs, David (2006). Britain since 1945: A Political History. Taylor & Francis. ISBN 978-0-415-39326-3. Chin, Rita (2009). "Guest Worker Migration and the Unexpected Return of Race". After the Nazi Racial State: Difference and Democracy in Germany and Europe. University of Michigan Press (published 2010). ISBN 978-0-472-02578-7. Cochrane, Feargal (2001). Unionist Politics and the Politics of Unionism since the Anglo-Irish Agreement. Cork University Press (published 1997). ISBN 978-1-85918-138-6.
Cooper, James (2010). "The Foreign Politics of Opposition: Margaret Thatcher and the Transatlantic Relationship before Power". Contemporary British History. 24 (1): 23–42. doi:10.1080/13619460903565358. Cowley, Philip; Bailey, Matthew (2000). "Peasants' Uprising or Religious War? Re-examining the 1975 Conservative Leadership Contest". British Journal of Political Science. 30 (4): 599–630. doi:10.1017/s0007123400000260. JSTOR 194287. "Cream of the crop at Royal Society". New Scientist. 99 (1365): 5. 7 July 1983. Crewe, Ivor (1991). "Margaret Thatcher: As the British Saw Her" (PDF). The Public Perspective: 15–16. Archived from the original (PDF) on 5 January 2019. Retrieved 17 March 2019. Dale, Iain; Tucker, Grant, eds. (2012). The Margaret Thatcher Book of Quotations. Biteback. ISBN 978-1-84954-465-8. English, Richard (2005). Armed Struggle: The History of the IRA. Oxford University Press (published 2004). ISBN 978-0-19-517753-4. Evans, Eric J. (2004). Thatcher and Thatcherism. Routledge (published 2013). ISBN 978-0-415-66018-1. Floud, Roderick; Johnson, Paul, eds. (2004). The Cambridge Economic History of Modern Britain: Structural Change and Growth, 1939–2000. 3. Cambridge University Press. ISBN 978-0-521-52738-5. Friedman, Lester D., ed. (2006). Fires Were Started: British Cinema and Thatcherism. Wallflower Press. ISBN 978-1-904764-71-7. Gamble, Andrew (2009). The Spectre at the Feast: Capitalist Crisis and the Politics of Recession. Palgrave Macmillan. ISBN 978-0-230-24052-0. Gardiner, Nile; Thompson, Stephen (2013). Margaret Thatcher on Leadership: Lessons for American Conservatives Today. Regnery. ISBN 978-1-62157-179-7. Gelb, Joyce (1989). Feminism and Politics: A Comparative Perspective. University of California Press. ISBN 978-0-520-07184-1. Glover, Peter C.; Economides, Michael J. (2010). Energy and Climate Wars: How Naive Politicians, Green Ideologues, and Media Elites are Undermining the Truth about Energy and Climate. Bloomsbury. ISBN 978-1-4411-5307-4. Görtemaker, Manfred, ed. (2006). Britain and Germany in the Twentieth Century. Berg. ISBN 978-1-85973-842-9. Hansen, Randall (2000). 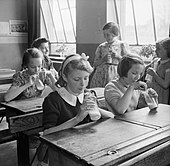 Citizenship and Immigration in Post-war Britain. Oxford University Press. ISBN 978-0-19-158301-8. Hastings, Max; Jenkins, Simon (1983). The Battle for the Falklands. Macmillan (published 2012). ISBN 978-0-330-53676-9. "House of Lords Minute" (PDF). 244. House of Lords: 218. Retrieved 9 March 2018. Jackling, Roger (2005). "The Impact of the Falklands Conflict on Defence Policy". In Badsey, Stephen; Grove, Mark; Havers, Rob (eds.). The Falklands Conflict Twenty Years On: Lessons for the Future. Routledge. ISBN 978-0-415-35029-7. James, Clive (1977). "Thatcher takes command". Visions Before Midnight. Macmillan (published 2017). ISBN 978-1-5098-3244-6. Johnson, Christopher (1991). The Grand Experiment: Mrs. Thatcher's Economy and How It Spread. Westview Press. ISBN 978-0-8133-1913-1. Jones, Bill (2007). "Media organisations and the political process". In Jones, Bill; Kavanagh, Dennis; Moran, Michael (eds.). Politics UK. Pearson Education. ISBN 978-1-4058-2411-8. Kaplan, Morton (2000). Character and Identity: The Sociological Foundations of Literary and Historical Perspectives. 2. Professors World Peace Academy. ISBN 978-1-885118-10-3. OL 8702932M. Khabaz, David V. (2007). Manufactured Schema: Thatcher, the Miners and the Culture Industry. Troubador (published 2006). ISBN 978-1-905237-61-6. Klein, Rudolf (1985). "Why Britain's conservatives support a socialist health care system". Health Affairs. 4 (1): 41–58. doi:10.1377/hlthaff.4.1.41. Lahey, Daniel James (2013). "The Thatcher government's response to the Soviet invasion of Afghanistan, 1979–1980". Cold War History. 13 (1): 21–42. doi:10.1080/14682745.2012.721355. Lanoue, David J.; Headrick, Barbara (1998). "Short-Term Political Events and British Government Popularity: Direct and Indirect Effects". Polity. 30 (3): 423, 427, 431–432. doi:10.2307/3235208. JSTOR 3235208. Lawson, Nigel (1992). The View from No. 11: Memoirs of a Tory Radical. Bantam Books. ISBN 978-0-593-02218-4. Laybourn, Keith (1992). A history of British Trade Unionism, c. 1770–1990. Stroud, UK: Alan Sutton. ISBN 978-0-86299-785-4. Lewis, Roy (1980). 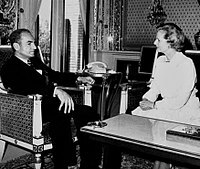 "From Zimbabwe‐Rhodesia to Zimbabwe: The Lancaster House conference". The Round Table: The Commonwealth Journal of International Affairs. 70 (277): 6–9. doi:10.1080/00358538008453415. Marr, Andrew (2007). A History of Modern Britain. Pan Books (published 2009). ISBN 978-0-330-51329-6. Marriott, John (1923). English Political Institutions: An Introductory Study. Oxford: Clarendon Press. OL 17361473W. McAleese, Dermot (2004). Economics for Business: Competition, Macro-stability, and Globalisation. FT Press. ISBN 978-0-273-68398-8. Mitchell, Mark; Russell, Dave (1989). "Race, the new right and state policy in Britain". Immigrants & Minorities. 8 (1–2): 175–190. doi:10.1080/02619288.1989.9974714. Moloney, Ed (2002). A Secret History of the IRA. Penguin Books (published 2007). ISBN 978-0-14-190069-8. Moore, Charles (2013). 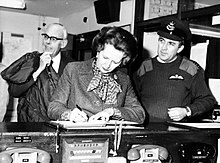 Margaret Thatcher: From Grantham to the Falklands. 1. Knopf Group. ISBN 978-0-307-95894-5. (2015). Margaret Thatcher: Everything She Wants. 2. Penguin Books. ISBN 978-0-241-20126-8. Ogden, Chris (1990). 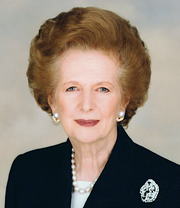 Maggie: An Intimate Portrait of a Woman in Power. Simon & Schuster. ISBN 978-0-671-66760-3. OL 2002988W. Panton, Kenneth J.; Cowlard, Keith A., eds. (2008). Historical Dictionary of the Contemporary United Kingdom. p. 640; biographies of people active 1979–2007. Parker, David; Martin, Stephen (1995). "The impact of UK privatisation on labour and total factor productivity". Scottish Journal of Political Economy. 42 (2): 216–217. doi:10.1111/j.1467-9485.1995.tb01154.x. Purvis, June (2013). "What Was Margaret Thatcher's Legacy for Women?". Women's History Review. 22 (6): 1014–1018. doi:10.1080/09612025.2013.801136. Reitan, Earl A. (2003). The Thatcher Revolution: Margaret Thatcher, John Major, Tony Blair, and the Transformation of Modern Britain, 1979–2001. Rowman & Littlefield. ISBN 978-0-7425-2203-9. Richards, Howard (2004). Understanding the Global Economy. Peace Education Books. ISBN 978-0-9748961-0-6. Rothbard, Murray (1995). Making Economic Sense. Ludwig von Mises Institute (published 2006). ISBN 978-1-61016-401-6. Rowthorn, Robert; Wells, John R. (1987). De-Industrialization and Foreign Trade. CUP Archive. ISBN 978-0-521-26360-3. Sanders, David; Ward, Hugh; Marsh, David (1987). "Government Popularity and the Falklands War: A Reassessment". British Journal of Political Science. 17 (3): 281–313. doi:10.1017/s0007123400004762. Scott-Smith, Giles (2003). "'Her Rather Ambitious Washington Program': Margaret Thatcher's International Visitor Program Visit to the United States in 1967". British Contemporary History. 17 (4): 65–86. doi:10.1080/13619460308565458. ISSN 1743-7997. Seldon, Anthony; et al. (2000). Britain under Thatcher. Taylor & Francis (published 2014). ISBN 978-1-317-88291-6. (2007). Blair's Britain, 1997–2007. Cambridge University Press. ISBN 978-1-139-46898-5. Senden, Linda (2004). Soft Law in European Community Law. Hart. ISBN 978-1-84113-432-1. Seward, Ingrid (2001). The Queen and Di: The Untold Story. Arcade. ISBN 978-1-55970-561-5. Sked, Alan; Cook, Chris (1993). Post-War Britain: A Political History, 1945–1992 (4th ed.). Harmondsworth, UK: Penguin. ISBN 978-0-14-017912-5. Smith, Gordon (1989). Battles of the Falklands War. Ian Allan. ISBN 978-0-7110-1792-4. Soames, Baron (1980). "From Rhodesia to Zimbabwe". International Affairs. 56 (3): 405–419. doi:10.2307/2617389. JSTOR 2617389. Stewart, Graham (2013). Bang! : A History of Britain in the 1980s. Atlantic Books. ISBN 978-1-78239-137-1. Tewdwr-Jones, Mark (2003). The Planning Polity: Planning, Government and the Policy Process. Routledge (published 2005). ISBN 978-1-134-44789-3. 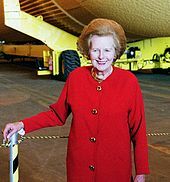 Thatcher, Margaret (1993). The Downing Street Years. HarperCollins. ISBN 978-0-00-255354-4. (1995). The Path to Power. HarperCollins. ISBN 978-0-00-638753-4. Thornton, Richard C. (2006). The Reagan Revolution II: Rebuilding the Western Alliance. Trafford (published 2004). ISBN 978-1-4120-1356-7. Veljanovski, Cento (1990). "The Political Economy of Regulation". In Dunleavy, Patrick; Gamble, Andrew; Peele, Gillian (eds.). Developments in British Politics. 3. Macmillan. ISBN 978-0-312-04844-0. Vinen, Richard (2009). Thatcher's Britain: The Politics and Social Upheaval of the Thatcher Era. Simon & Schuster (published 2013). ISBN 978-1-4711-2828-8. Wapshott, Nicholas (2007). Ronald Reagan and Margaret Thatcher: A Political Marriage. Sentinel. ISBN 978-1-59523-047-8. Ward, Paul (2004). "A new way of being British". Britishness since 1870. Psychology Press. ISBN 978-0-415-22016-3. West, Chris (2012). First Class: A History of Britain in 36 Postage Stamps. Random House. ISBN 978-1-4481-1437-5. Williams, Gary (2001). "'A Matter of Regret': Britain, the 1983 Grenada Crisis, and the Special Relationship". Twentieth Century British History. 12 (2): 208–230. doi:10.1093/tcbh/12.2.208. Witte, Rob (2014). Racist Violence and the State: A Comparative Analysis of Britain, France and the Netherlands. Routledge. ISBN 978-1-317-88919-9. Yahuda, Michael B. (1996). Hong Kong: China's Challenge. Psychology Press. ISBN 978-0-415-14071-3. Zemcov, Ilya; Farrar, John (2007). Gorbachev: The Man and the System. Transaction (published 1989). ISBN 978-1-4128-1382-2. This page was last edited on 24 April 2019, at 08:52 (UTC).